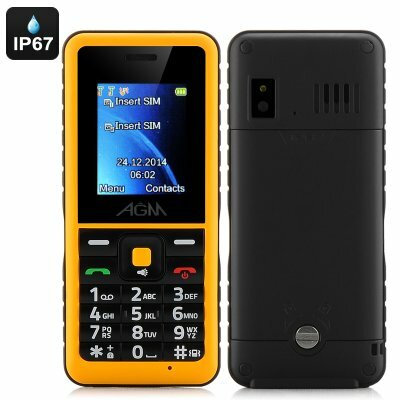 Successfully Added AGM Stone 2 Feature Phone - IP67 Waterproof Rating, Quad-Band, Bluetooth, FM Radio, Micro SD Card Slot (Yellow to your Shopping Cart. The AGM Stone 2 Feature Phone boasts an IP67 Waterproof Rating, 1.7 Inch Display, Quad-Band, Bluetooth, FM Radio as well as a Micro SD Card Slot. 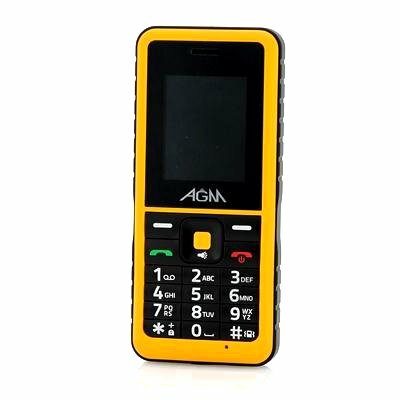 The Stone 2 feature phone from AGM was made to survive the hardships of a hectic life and was built for durability. The old school look is reminiscent of old Nokia phones but the Stone 2 has some great features keeping it up to date. With two GSM SIM card slots you can organize your contacts on business or personal numbers and each one supports quad band communications 850/900/1800/1900MHz bandwidths so it can be used in many different regions. The IP67 waterproof rating means it doesn’t matter if the Stone 2 gets wet as it’s protective outer keeps it immune to most water and dust exposure. This robust mobile phone is suitable for anyone working in an unforgiving outdoor environment and the keypad is simple to use even with gloves on making the Stone 2 a top choice for the sensible user. A small 1.7 inch display is easily viewed, and the custom operating system is intuitive to navigate with menus for and access to all standard functions. Sync this phone with Bluetooth devices such as headsets and speakers or pair it to your friend’s device for transferring data. Be sure to check out the AGM Stone 2 phone we think you will be surprised at how good it is. This product is in stock now, we guarantee next working day shipping and offer a 12 months warranty on all our products. Brought to you by the leader in electronic devices and wholesale phones, Chinavasion.